Which protocol is used by EIGRP to send hello packets? How do EIGRP routers establish and maintain neighbor relationships? What is indicated when an EIGRP route is in the passive state? The route has the highest path cost of all routes to that destination network. The route is a feasible successor and will be used if the active route fails. The route is viable and can be used to forward traffic. There is no activity on the route to that network. The route must be confirmed by neighboring routers before it is put in the active state. In an EIGRP topology table, a route that is in a/an (active, ACTIVE) state will cause the Diffusing Update Algorithm to send EIGRP queries that ask other routers for a path to this network. 24. Fill in the Blank. Use the abbreviation. EIGRP uses the (RTP) protocol to deliver EIGRP packets to neighbors. 25. What information does EIGRP maintain within the routing table? R3 has two possible paths to the 172.16.99.0 network. What is the reported distance of the feasible successor route? 29. 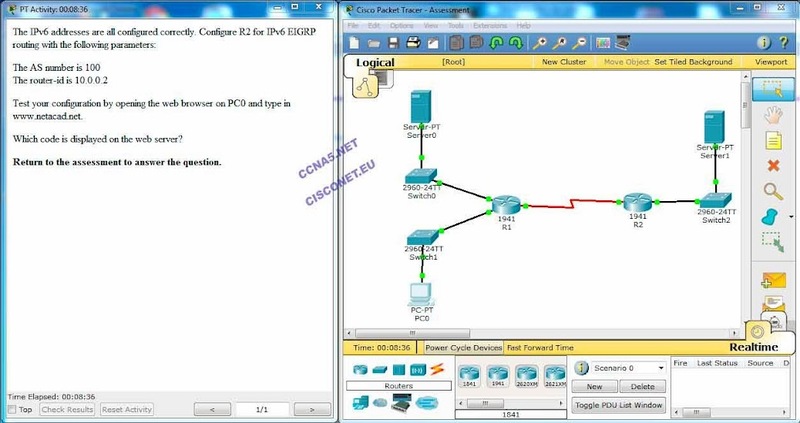 Which configuration is necessary to ensure successful operation of EIGRP for IPv6? The network command is required within the router configuration mode. The no shutdown command is required within the router configuration mode. The eigrp router-id command requires an IPv6 address within the router configuration mode. 30. What is identified within the opcode of an EIGRP packet header? 31. An administrator issues the router eigrp 100 command on a router. What is the number 100 used for? 32. What is the multicast address used by an EIGRP-enabled router operating with IPv6?